Heat oven to 400°F. Cut each tortilla in half; cut each half crosswise into 1/4-inch strips. Place on ungreased cookie sheet; spray strips with cooking spray. Bake at 400°F. for 8 to 10 minutes until lightly toasted, stirring once halfway through baking. Set aside. In medium bowl, mix orange juice, 2 tablespoons oil, the mustard, honey, ground red pepper and cumin. In small bowl, reserve 6 tablespoons orange juice mixture for garnish. To remaining mixture, add beans, corn and tomato; mix well. Sprinkle salt on both sides of each chicken breast half. In 12-inch nonstick skillet, heat 1 tablespoon of the oil over medium-high heat. Add chicken; cook 5 to 8 minutes on each side until chicken is fork-tender and juices run clear. Remove chicken from skillet; place on plate and cover to keep warm. To same skillet, add remaining 1 tablespoon oil. Add both bell peppers, onions and garlic; cook and stir 1 minute. Add wine and thyme; cook and stir an additional minute. To serve, spread 1 tablespoon reserved orange juice mixture on each serving plate. Cut each chicken breast half diagonally into slices; place over mixture on plates. Spoon bell pepper mixture over chicken. Top each with 1/2 cup salsa. Sprinkle each with 1 teaspoon cilantro. 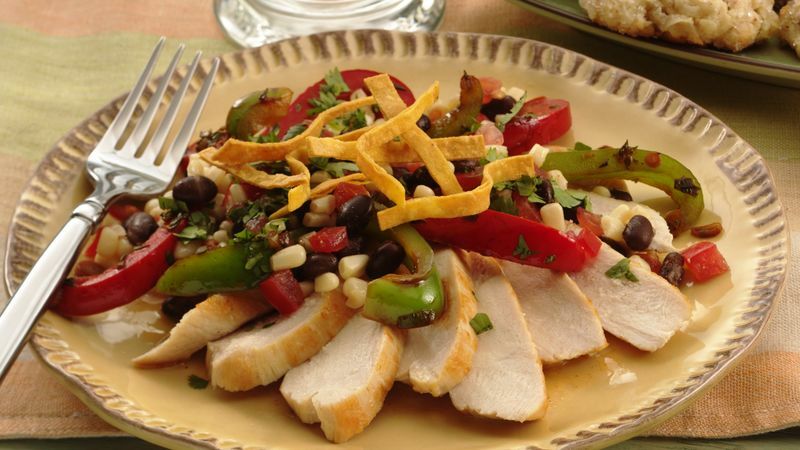 Top each with tortilla strips.